American Easter egg from the White House Washington, D.C.
Pace eggs boiled with onion skins and leaf patterns. ↑ David Leeming (2005). The Oxford Companion to World Mythology. Oxford University Press. ശേഖരിച്ചത്: 10 March 2013. For many, Easter is synonymous with fertility symbols such as the Easter Rabbit, Easter Eggs, and the Easter lily. ↑ Anne Jordan (5 April 2000). Christianity. Nelson Thornes. ശേഖരിച്ചത്: 7 April 2012. Easter eggs are used as a Christian symbol to represent the empty tomb. The outside of the egg looks dead but inside there is new life, which is going to break out. The Easter egg is a reminder that Jesus will rise from His tomb and bring new life. 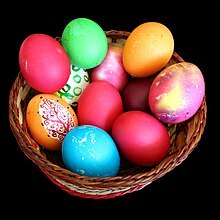 Orthodox Christians dye boiled eggs red to make red Easter eggs that represent the blood of Christ shed for the sins of the world. ↑ Gordon Geddes, Jane Griffiths (22 Jan 2002). Christian belief and practice. Heinemann. ശേഖരിച്ചത്: 7 April 2012. Red eggs are given to Orthodox Christians after the Easter Liturgy. They crack their eggs against each other's. The cracking of the eggs symbolizes a wish to break away from the bonds of sin and misery and enter the new life issuing from Christ's resurrection. ഈ താൾ അവസാനം തിരുത്തപ്പെട്ടത്: 04:00, 22 ഏപ്രിൽ 2019.